Welcome To Day 27 Of Baking With Pumpkin! Here we are, at the last few days of pumpkin recipes! It really has been a lot of fun for me. I’ve gotten to try so many different recipes and have enjoyed them all so far. I have something quite different for you today! I know many of us are pet owners and love our furbabies and love to give them healthy, tasty treats. It’s been a while since I made ones for my two little girls and I know with all the baking I do, they are always looking at me and saying with their eyes “Where’s ours momma”? Needless to say these are treats that had my girls begging for more! They also make your house smell amazing while baking. I like that it’s really easy to make these cookies any size you want or prefer. Since my girls are small, I made these treats small. Just adjust the baking time. I baked these for the full 15 minutes and the toothpick came out nice and clean. 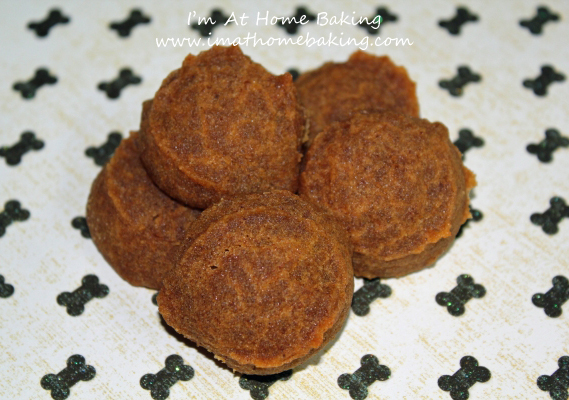 What’s great about baking anything at home, is our ability to control the ingredients we put into our goodies and it is just as important for our pets as it is for us. In one bowl, mix Rice Flour, Cinnamon, and Ginger together. In another bowl, mix Pumpkin, Egg, Honey and Vegetable Oil. Mix the wet ingredients into the dry. The consistency should be like a thick pudding. Use a spoon or a cookie scoop and drop them onto a cookie sheet and bake for 15 minutes. I did use parchment paper on my cookie sheets but it's not necessary. To check if they are done, stick a toothpick in the center and if it comes out clean they are done.